The 787 gives you the measurement capabilities of a Fluke reliable Digital Multimeter plus the ability to source, simulate, or measure DC current with 1 microamp resolution and accuracy of 0.05%. Put it all together and you have the ideal tool for troubleshooting and calibrating current loop applications. So if you're tired of always tracking down a calibrator, lugging around two tools and switching back and forth, get the single best solution for doubling your power. 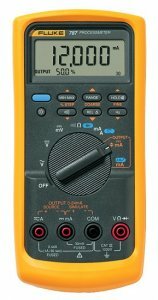 The 787 ProcessMeter from Fluke. Simultaneous mA and % of scale readout on mA output. 25% Manual Step plus Auto Step and Auto Ramp on mA output. Clear LCD with backlight; 4,000 counts (30,000 counts for dc current).